FELINE GREENIES™ SMARTBITES™ Healthy Skin & Fur Treats Chicken Flavor is rated 5.0 out of 5 by 2. FELINE GREENIES™ SMARTBITES™ Healthy Skin & Fur Cat Treats are formulated to meet the nutritional levels established by the AAFCO Cat Food Nutrient Profiles for adult maintenance. FELINE GREENIES™ SMARTBITES™ Healthy Skin & Fur cat treats are formulated for cats one year of age or older. Feed as a snack or treat in conjunction with your cat’s regular diet. For a healthy skin and fur benefit, feed daily. 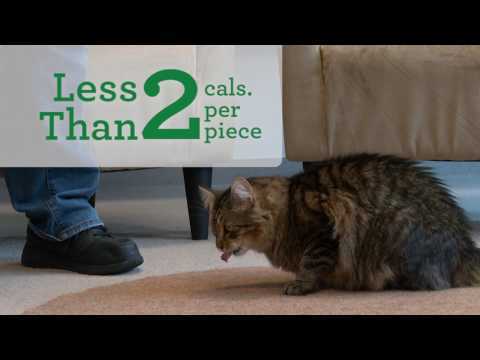 As with any treat, adjust amount of main meal to compensate for calories delivered by treats. Always monitor your pet while feeding a treat. Provide fresh drinking water at all times. See your veterinarian regularly. To help maintain freshness, we recommend sealing the bag tightly and storing in a cool, dry location. Rated 5 out of 5 by Chyyy from THE BEST TREATS!! My cat adores these, and will only eat these treats. Ever since I've started her on these, her skin and fur are gorgeous. I'm in love with these, will always buy these for her. Rated 5 out of 5 by Bunchito from Smartbites skin and coat I find that this product does help to keep my hyperthyroid cat's fur/coat in better conduction. Also,because she really likes the flavor I use a small piece of the Smartbite to press into the GREENIES Pill pocket after I have inserted her thyroid pill. Initially, she took her pill with just the Pill Pocket but then she became bored with just the Pill Pocket. Now she takes her pill easily gets an extra bit of her treat(The Smartbite) along with 2 whole Smartbites as a chaser, LOL and her coat looks healthier and she gets her medicine. It;s a win win. Btw my cat likes the Chicken flavor your cat might have different taste preferences. Debra, with CAUSE 4 PAWS.